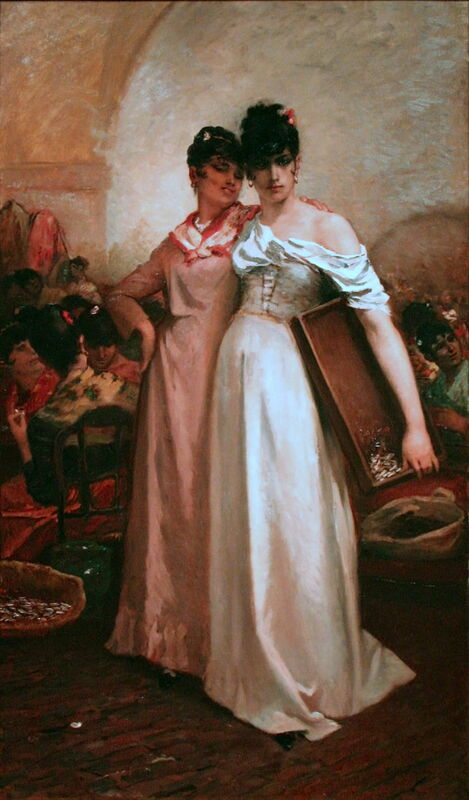 Constantin Meunier (1831–1905), Two Women in a Tobacco Factory in Seville (c 1883), oil on canvas, dimensions not known, M van Museum Leuven, Leuven, Belgium. Image by Ophelia2, via Wikimedia Commons. In the late nineteenth century, there were many individual artists whose paintings didn’t really conform to any particular school, so defy classification. Constantin Meunier (1831–1905) is a good example: although many of his works have features in common with Naturalism, and he seems to have had connections with Naturalist art, his style is quite distinct. This is the first of two articles looking at his paintings. Meunier was born in a working-class district of the city of Brussels in 1831. His older brother had trained as an engraver, spotted young Constantin’s talents, and encouraged him to pursue them in his career. He started his studies at the Academy of Fine Arts in Brussels in 1845, where he concentrated on sculpture rather than painting. On completion, he worked in the studios of two sculptors, and in 1851 exhibited his first plaster sketch at the Brussels Salon. In the 1850s, following the advice of the painter Charles de Groux, he concentrated on painting. He completed a series about the lives of Trappists, but I have been unable to locate any usable images of these earlier paintings. Constantin Meunier (1831–1905), The Peasant War – Assembling (1875), oil on canvas, dimensions not known, Meunier Museum, Brussels, Belgium. Image by Szilas, via Wikimedia Commons. 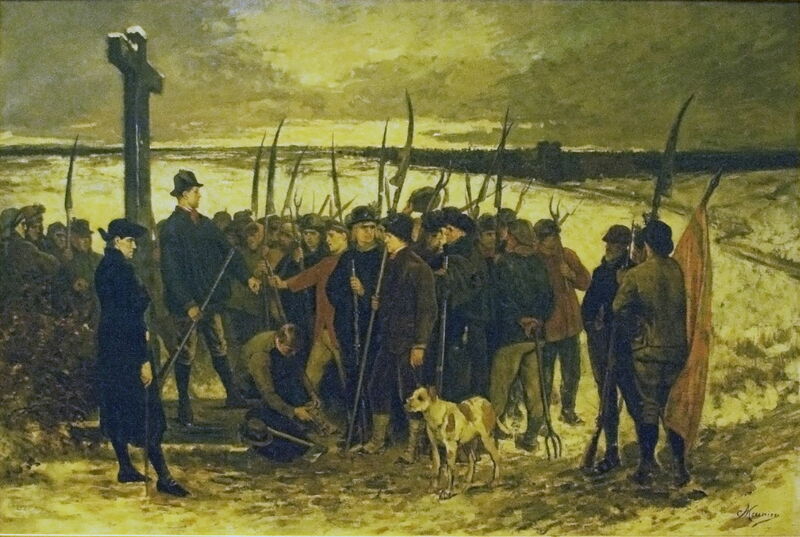 At a time of rising social concern, Meunier painted The Peasant War – Assembling in 1875. It shows country people gathering in the autumn of 1798 in an uprising against the French occupation of what is now on the borders of modern Belgium, Germany, and Luxembourg. This was part of the French Revolution, now little-known outside Belgium and Luxembourg. In a month’s rebellion, around 15,000 were killed, and the French crushed the rebels. From 1880 onwards, Meunier was commissioned to paint miners and workers in Belgium, which he continued to do for the rest of his career. I will look at those works in the next article in this series, as they’re rather special. 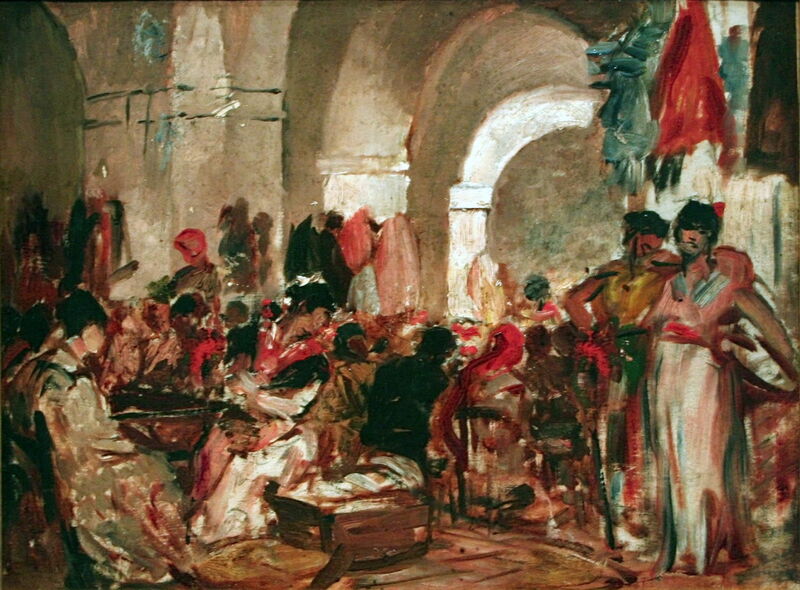 He went to Spain in 1882, where he was commissioned to copy a painting in Seville. He seized the opportunity to paint much more than that. Constantin Meunier (1831–1905), Procession of Silence, Seville (1882-83), oil on canvas, dimensions not known, Meunier Museum, Brussels, Belgium. Image by Szilas, via Wikimedia Commons. 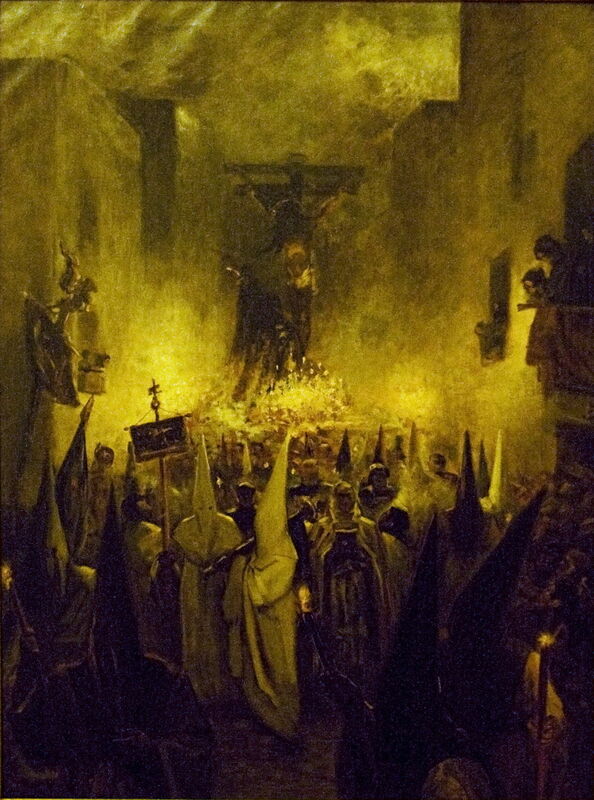 Procession of Silence, Seville from 1882-83 shows one of the silent processions which take place in Seville and elsewhere during the Holy Week of Easter. 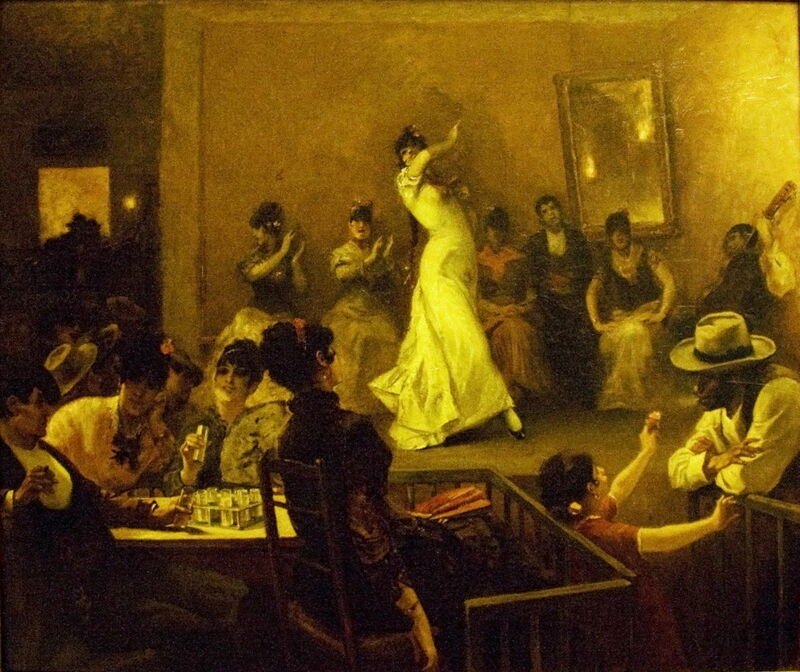 Constantin Meunier (1831–1905), Café del Buzero, Seville (date not known), oil on canvas, dimensions not known, Meunier Museum, Brussels, Belgium. Image by Szilas, via Wikimedia Commons. Café del Buzero, Seville is a total contrast, showing the interior of one of the city’s bars, with a dancer up on stage. Constantin Meunier (1831–1905), Cigar Makers in Seville (study) (date not known), oil on canvas, 72.4 × 87.2 cm, M van Museum Leuven, Leuven, Belgium. Image by Ophelia2, via Wikimedia Commons. Meunier took time to visit the major local industry at the time, tobacco manufacturing. This had started on a grand scale in 1728, with the construction of the Royal Tobacco Factory under King Charles III, which soon became the second largest building in Spain. This study for Cigar Makers in Seville was clearly sketched very briskly. Constantin Meunier (1831–1905), Tobacco Factory, Seville (1883), oil on canvas, dimensions not known, Meunier Museum, Brussels, Belgium. Image by Szilas, via Wikimedia Commons. Meunier’s finished painting of the Tobacco Factory, Seville from 1883 gives an idea of the scale of the works, employing many of the women of the city. 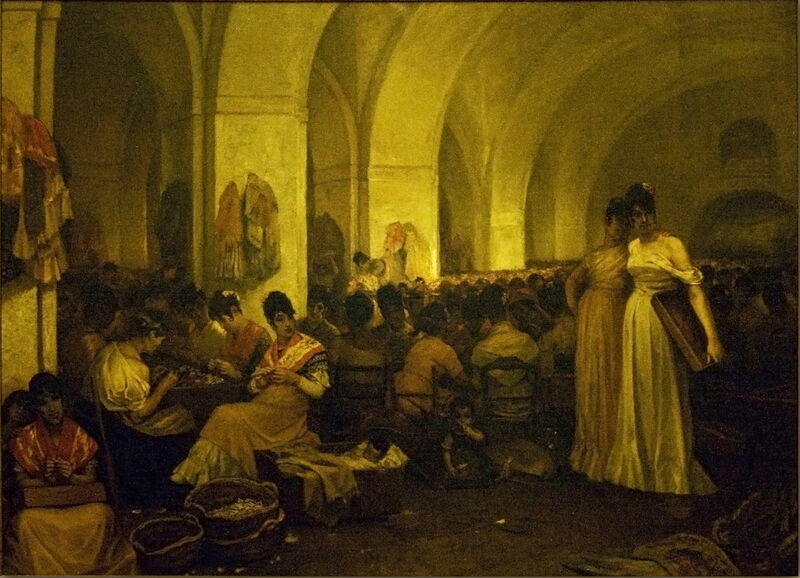 He also painted this double portrait of Two Women in a Tobacco Factory in Seville at about that time. Meunier returned to Belgium in 1883, where he was appointed professor at the Louvain Academy of Fine Arts. He then seems to have concentrated more on sculpture, but went and painted the lives of fishing families on the Belgian coast. 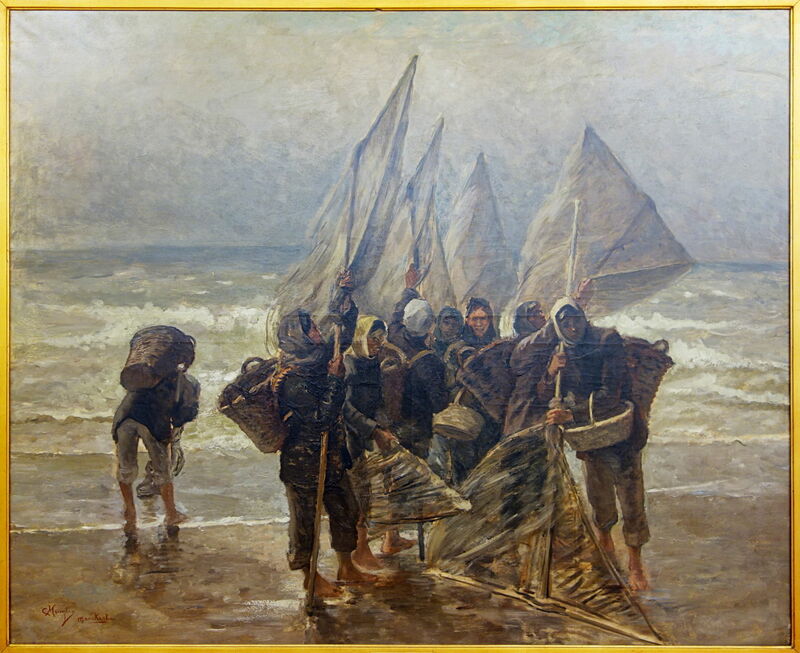 Constantin Meunier (1831–1905), Shrimp Fishermen in Mariakerke (1885), further details not known. Wikimedia Commons. In 1885, he painted Shrimp Fishermen in Mariakerke, then a separate village to the west of Ostend on the southern coast of the North Sea. Constantin Meunier (1831–1905), The Harbour (1886), oil on canvas, dimensions not known, Meunier Museum, Brussels, Belgium. Image by Szilas, via Wikimedia Commons. The Harbour from 1886 shows one of the large docks on the coast of the North Sea, with dockworkers labouring to move large sacks away from the dockside. 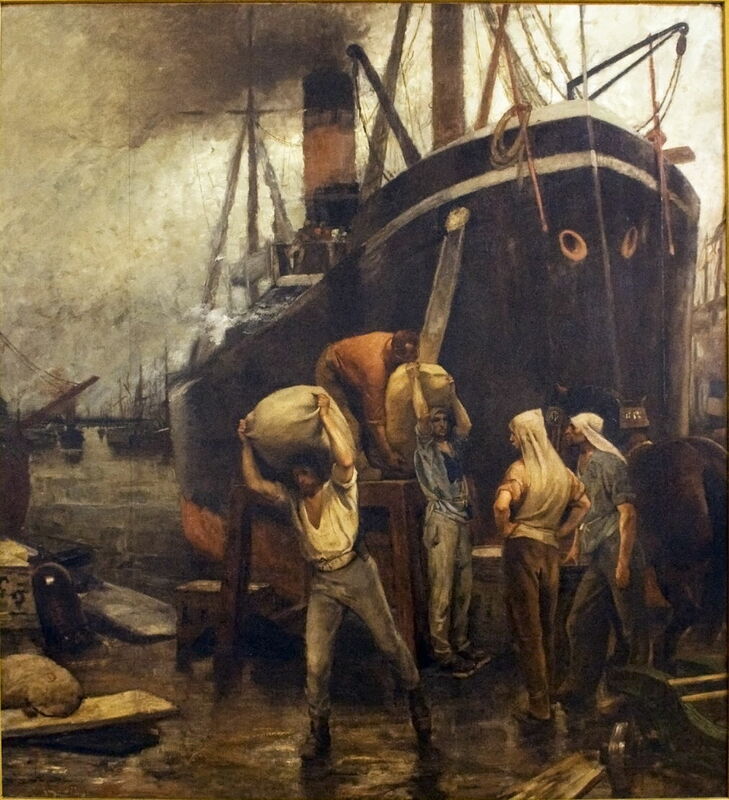 This was painted at the height of Naturalism, when Henri Gervex, for example, had exhibited The Quai de la Villette, Paris in 1882, showing the labour of colliers in Paris. 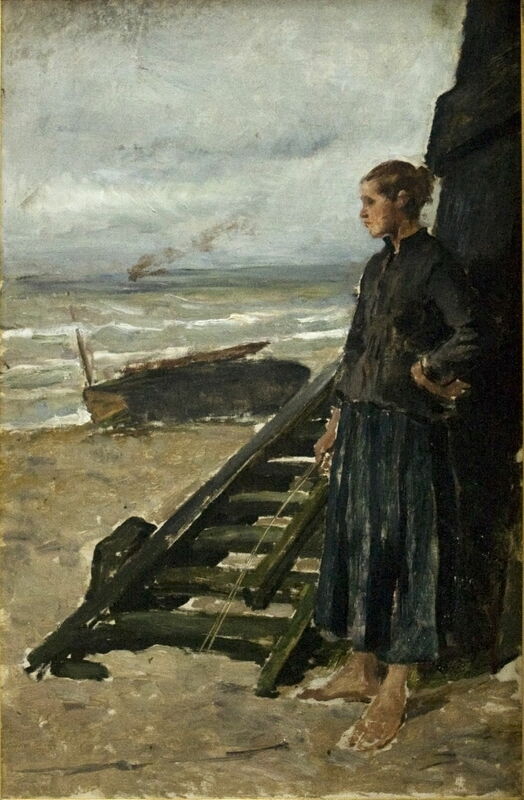 Constantin Meunier (1831–1905), Fisherman’s Daughter at Nieuwpoort (date not known), oil on canvas, dimensions not known, Meunier Museum, Brussels, Belgium. Image by Szilas, via Wikimedia Commons. Fisherman’s Daughter at Nieuwpoort shows a poor girl in another fishing community on the coast of Flanders, Belgium. Not known for his portraits, he painted two wonderful works showing Jeanne Meunier, who I can only presume was his daughter. Constantin Meunier (1831–1905), Portrait of Jeanne Meunier (1886), oil on canvas, dimensions not known, Musée d’Ixelles, Ixelles, Belgium. Wikimedia Commons. This formal Portrait of Jeanne Meunier was painted in 1886. 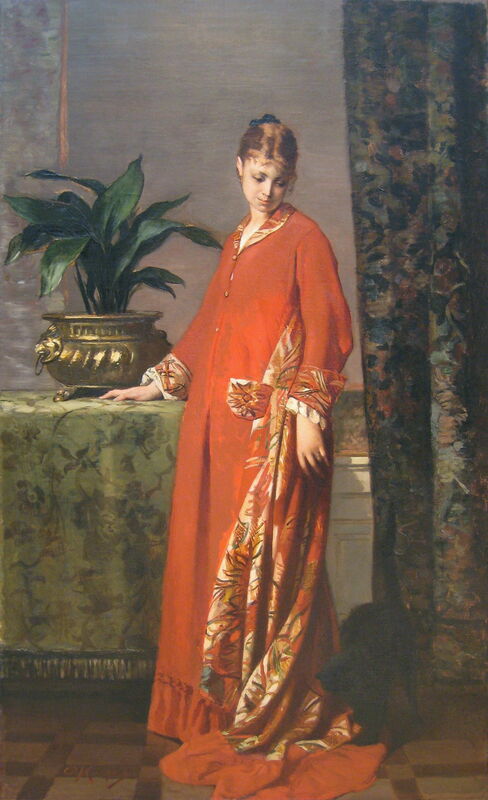 Her gown shows the influence of Japonisme. Constantin Meunier (1831–1905), Jeanne Meunier (c 1895), oil on canvas, dimensions not known, Meunier Museum, Brussels, Belgium. Image by Szilas, via Wikimedia Commons. Nearly a decade later, in about 1895, he painted Jeanne Meunier in his studio. 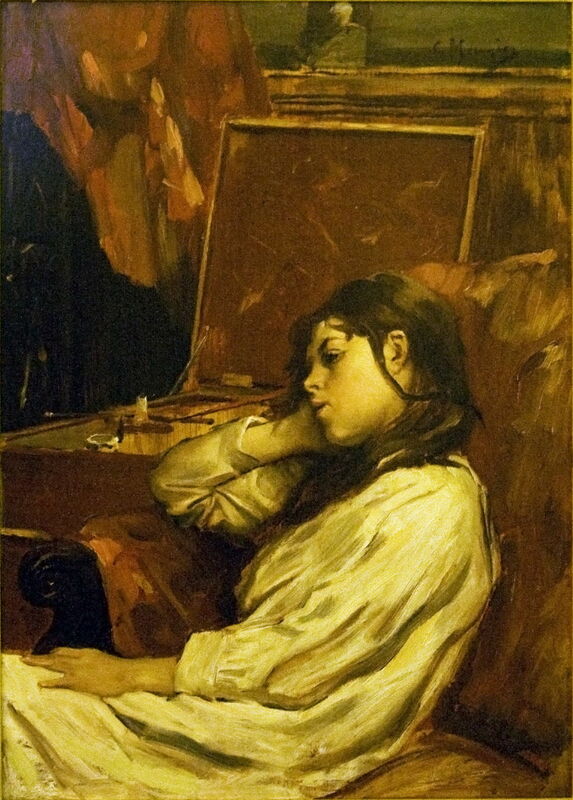 She looks more tired and drawn, and behind her is the artist’s glass palette with his tools resting on it. In the next and final article I will look at his paintings of coal mines and other heavy industries. Posted in General, Life, Painting and tagged Gervex, Meunier, naturalism, painting, realism, Spain. Bookmark the permalink.